As Egypt fights over new leadership, Israeli archaeologists have found evidence of an ancient ruler in northern Israel. At a site in Tel Hazor National Park, north of the Sea of Galilee, archaeologists from the Hebrew University of Jerusalem have unearthed part of a unique Sphinx belonging to one of the ancient pyramid-building pharaohs. The Sphinx was brought over from Egypt, with a hieroglyphic inscription between its front legs that bears the name of the Egyptian king Mycerinus, who ruled in the third millennium BCE, more than 4,000 years ago and was one of the builders of the famous Giza pyramids. 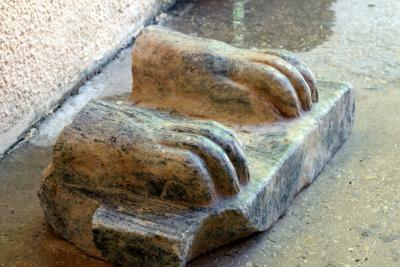 This fragment of a Sphinx statue was found by Hebrew University of Jerusalem archaeologists at the excavations at Tel Hazor, Israel, north of the Sea of Galilee. A hieroglyphic inscription ties the Sphinx to an Egyptian king who was a builder of the Giza pyramids, approximately 2500 BCE. The statue is unique, as the only one anywhere bearing this pharaoh's name. Photo courtesy of Hebrew University archaeologists, Prof. Amnon Ben-Tor and Dr. Sharon Zuckerman. Along with the king's name, the hieroglyphic inscription includes the descriptor "Beloved by the divine manifestation… that gave him eternal life." According to Prof. Amnon Ben-Tor, the Yigael Yadin Professor in the Archaeology of Eretz Israel at the Hebrew University's Institute of Archaeology, and Dr. Sharon Zuckerman, a lecturer at the Hebrew University's Institute of Archaeology, this text indicates that the Sphinx probably originated in the ancient city of Heliopolis (the city of 'On' in the Bible), north of modern Cairo. The Hazor Excavations are headed by Ben-Tor and Zuckerman.